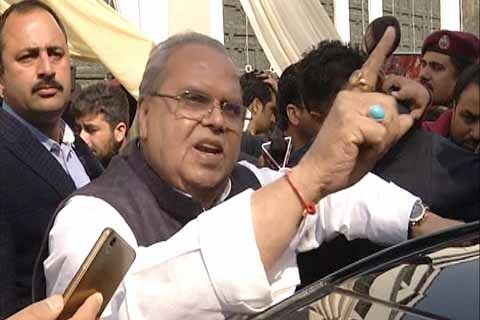 Supporting militants has become a political compulsion for Mehbooba Mufti ahead of the assembly elections in Jammu and Kashmir, the governor Satya Pal Malik said on Monday, day after the Peoples Democratic Party president warned the administration over alleged harassment of families of militants by the police. After her visit to the restive Pulwama district on Sunday, Mehbooba took to twitter and wrote: “Visited PatiporaPulwama where Rubina (whose brother happens to be a militant) was along with her husband and brother beaten mercilessly in police custody. The severe nature of her injuries has left her bedridden”. “I want to ask the governor that if you have a fight with a militant, why are his relatives, especially his sister, beaten? We will not allow this. I want to tell the governor and warn the police as well that if there is another such incident, then there will be dangerous consequences,” she had said. Replying to a media query about Mehbooba’s remarks, the governor said: “Since I am the governor, she will attack me. But I don’t feel bad about what she said a day earlier because she is the daughter of my friend (late Mufti Muhammad Sayeed)”. “Now that elections are coming nearer, it is her (Mehbooba’s) political compulsion to support militants to regain the lost base in the Valley,” Malik said on the sidelines of a function here. “We have strictly directed our forces to ensure that no injustice is done with any militant’s family. We don’t have any issue with their families. But at the same time, I want to assure her (Mehbooba) that if any family member of a militant, as she has claimed, has been harassed unnecessarily, it will be probed by a high-level committee,” the governor said. Asked how he sees the year gone by for Jammu and Kashmir, the governor said: “I believe that 2018 was very successful in the history of Jammu and Kashmir. During this year, democracy flourished in the state; the panchayat and municipal polls were conducted without even a single casualty. We also executed all the pending projects and we’re receiving massive support of the people who have now understood that if there is peace, there is a great scope of progress and development”. On reports of foiling of Pakistani BAT attack by Indian soldiers along the Line of Control on Monday and two casualties of the Pakistani soldiers, he said: “Our forces are working in close coordination and checking all attempts of intrusion. We will not allow anybody to enter our territory and disturb the peaceful atmosphere here. Whosoever intrudes will be killed. And, I also want to share with you (media) that now we’re getting massive support from the public in such anti-militant operations”.